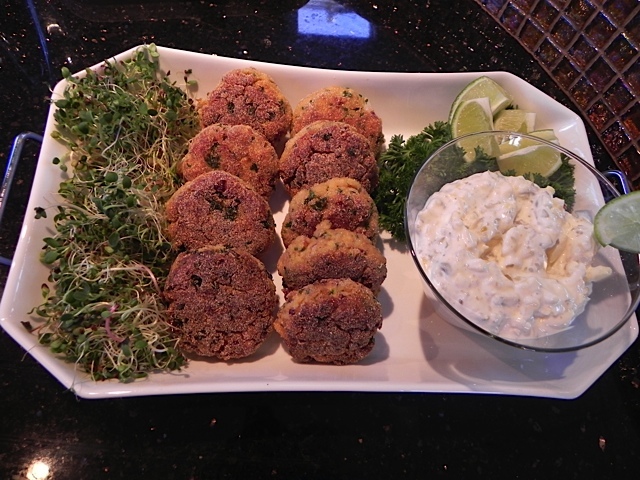 Here's a delicious recipe from the charter yacht LADY MARGARET, a 65-foot Horizon motor yacht. 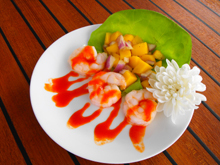 To make tartar sauce, whisk together the mango, mayonnaise, capers, and salt and pepper, to taste, in a medium bowl. Cover and refrigerate until ready to use. Heat 1/4-inch of oil in a large skillet over medium-high heat. Carefully put the cakes in the oil, 5 or 6 at a time, and cook until golden brown; about 3 to 4 minutes per side. 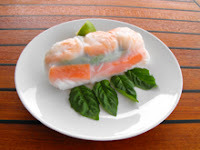 Transfer to a paper-towel lined plate to drain. 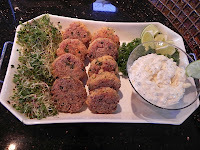 Arrange them on a serving platter and serve immediately with tartar sauce. 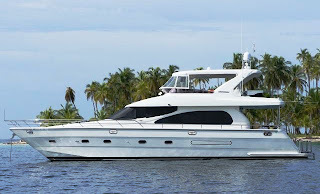 Lady Margaret is a 64-foot Horizon motor yacht with an owner-operator crew of two that specialize in 2-person yacht charters, although if family, they will take 3 or 4 guests... Inquire. SPECIAL OFFER for honeymooners (OK, second honeymoons, too! ): Book a charter for this season within the next two weeks (by March 8, 2013) and Lady Margaret will have a free bottle of Dom Perignon chilled and waiting upon your arrival! This beautiful motor yacht will be taking a cruise south through the Caribbean islands from the Leewards to the Windwards and back in May, June and July. They invite you to come along! 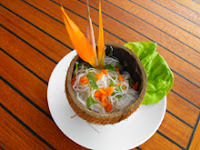 Join Captain Ken and Bruna Tatarow for the tropical trip of a life time. Quick with a laugh and a smile, they know how to host a truly enjoyable vacation. 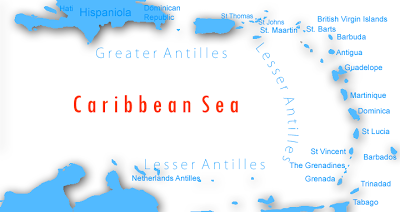 We received news from the charter catamaran Nauticat of Fowey who have been chartering in the Virgin Islands and are now going south to charter for a couple of months in the Grenadines. Even with their busy schedule, Nauticat has managed to install some upgrades such as four new electric-flush toilets and a new stove. In the galley, I have a fabulous new four burner stove and oven that reaches the temp it is meant to reach and allows me to juggle four pans rather than three adding to the dishes I can now prepare! Fresh home baked bread can now be smelt wafting through the boat and cakes turn out like a dream!! While the guests won’t even notice the new oven they all love playing with the new underwater camera and video recorder which they are welcome to use and at the end of the week we transfer all their great shots onto a CD for them to take home. It’s a great addition to the guests own above water shots and adds a whole new dimension when snorkeling. 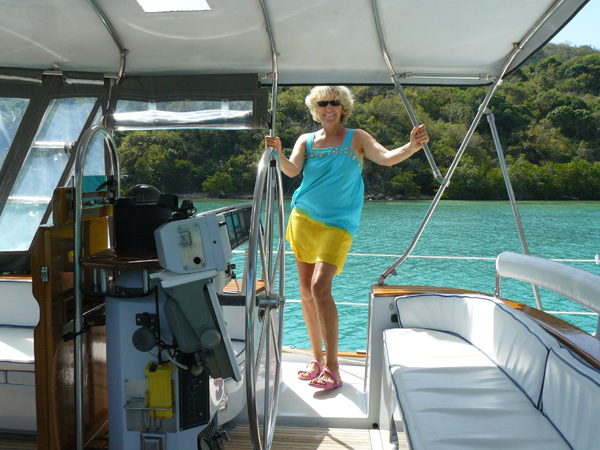 Nauticat of Fowey enjoy both the Virgin Islands and the Grenadines and will gladly charter in either location depending if it fits into their charter calendar. As many of you know, Nauticat of Fowey loves being in the Grenadines. We think it’s the perfect spot for guests who want to sail a bit further, relax on board with a good book, visit quieter anchorages that are more like the real Caribbean and stop every night at a great beach! There are also up-market resorts for those who want a little more sophistication but all in a laid back way. The diving here is great and the local boat boys add atmosphere. The Lobster BBQ on the beach at Tobago Cays is not to be beaten for a unique, local experience – no shoes required!! 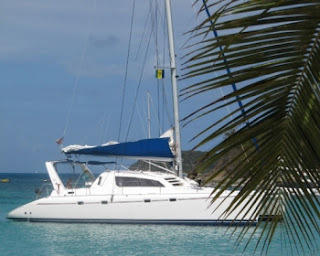 But we love the BVI’s as well – we’re flexible and available either BVI’s or Grenadines. 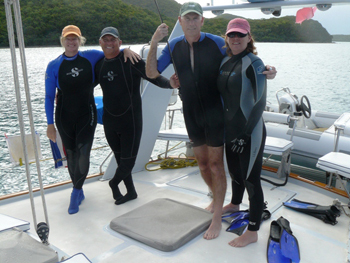 Family special for charters taking place in July and early August 2013. Six guests for the price of four. Kids love Nauticats two paddleboards, double kayaks, and underwater camera. Inquire for details! 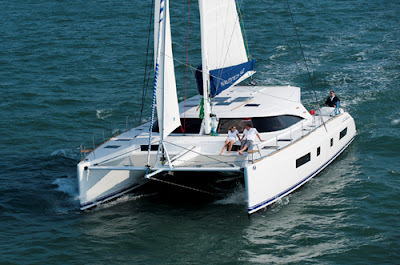 Nauticat of Fowey is a a 47-foot Leopard catamaran with a crew of two, Bill & Ali, who are owner-operators. Nauticat is fully air conditioned and accommodates up to 6 guests in 3 cabins, each with Queen berth and ensuite head/shower. Spend Easter sailing on VOO DOO, a beautiful 70-foot Hylas sloop, available in your choice of two beautiful Caribbean island groups. The British Virgins, with shorter sailing distances between islands, are great for first time charterers. Kids – and grown-ups too - love to explore the Baths and snorkel in the caves at Norman Island. Local shoreside spots range from first class resorts on Virgin Gorda to funky Foxy’s Beach Bar on Jost Van Dyke. The natural beauty of the Grenadines, located between St. Vincent and Grenada, is unmatched in the Caribbean with many parks and protected areas created to preserve wildlife. See manta rays, sea turtles and colorful tropical fish on your snorkeling expeditions safely escorted by Captain Christophe. The charter yacht VooDoo is a 70-foot Hylas sloop with a crew of two. 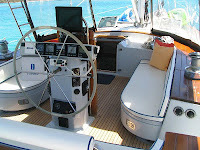 The yacht is fully air conditioned and accommodates up to 4 adults in two guests cabins. Three cabins are available on request as children are welcome. Captain Christophe has been involved in the marine industry since 1994. He has skippered both charter and private sailing yachts throughout the Caribbean and the Mediterranean. Christophe holds a 200-tonne Yacht Master Ocean License, as well as a USCG-100 ton license, and has completed many offshore miles, including five transAtlantic crossings. Chef June started sailing on small catamarans at the age of eleven and now holds a 200-tonne Yacht Master Ocean License. 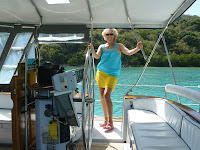 She has sailed over 40,000 miles throughout the Atlantic, Mediterranean, Caribbean and Pacific. 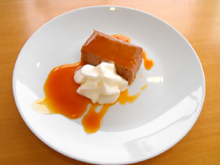 She enjoys designing menus that feature a variety of cuisines including classic French and European, healthy Mediterranean and Asian/fusion. June welcomes low fat, low cholesterol and other dietary restrictions as an opportunity to demonstrate her creativity. 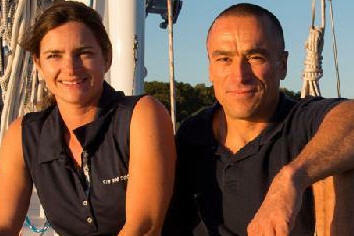 Christophe and June are a great team who love having families aboard. Whether you want an active, sporty vacation or a relaxing, quiet cruise to "recharge your batteries", they guarantee you will have a fantastic time on board VOODOO. 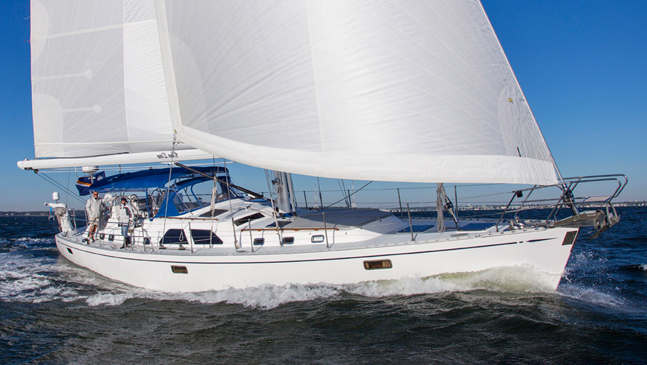 It's not too early to begin planning your Christmas / New Year sailing vacations. New Charter Yacht Catamaran GREENBOAT 1 - Welcome! We would like to welcome the new charter yacht, GreenBoat 1, a 2013 54-foot Nautitech catamaran with 4 Queen cabins, for Virgin Islands sailing vacations / yacht charters. GreenBoat opens their calendar beginning March 11, 2013. There hasn't been a big announcement about this catamaran to the charter industry yet, and they already have several holds. Once the word is out we expect them to be a very popular charter yacht, especially with their special introductory offer (see below). They are currently AVAILABLE for CHRISTMAS 2013 AND NEW YEARS. 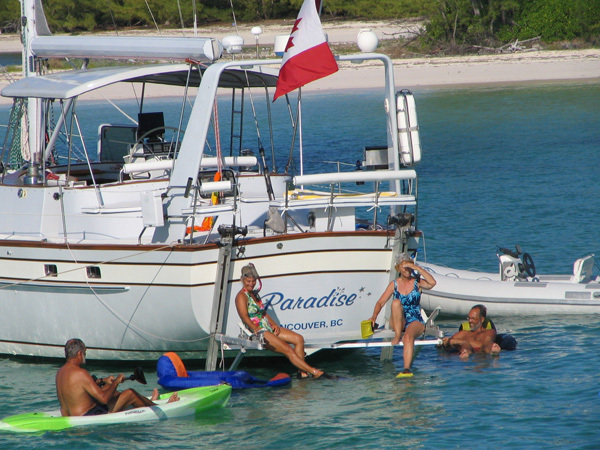 Don't wait too long, 8-person/ 4 cabin boats are booking fast for the holidays. Contact us! GreenBoat 1 is a 2013, 54-foot Nautitech catamaran designed to provide luxurious accommodations, high performance sailing and leading edge green technology for the smallest carbon footprint possible. 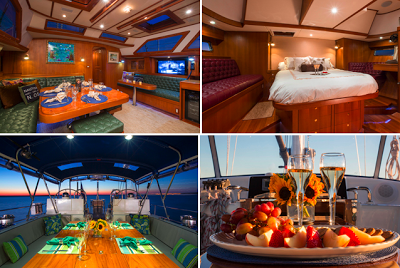 GreenBoat has a crew of two, is fully air conditioned and accommodates up to 6 charterers in 3 guest cabins, each with a tablet-controlled TV for music and movies, Queen-sized berth, private ensuite head with separate shower stall. GreenBoat has a 13-foot turbojet dinghy with 90HP motor, tube, 2-person kayaks, 2 SUPs, waterskis, kneeboard, wakeboard, 14-foot inflatable Hobie Smart Cat sailing dinghy, snorkle gear, underwater camera, onboard wifi, TV/DVD in salon, etc. One child age 6 or under may sail free with minimum 2 paying adults. Holidays excluded. First of all, we are happy to welcome into our fold the charter yacht PARADISE, an owner-operated, 54-foot Irwin cutter that accommodates up to four guests in two cabins. Contact us and we'll do the numbers for you! 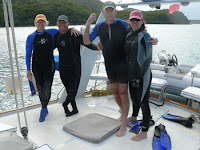 Paradise is offering a private, rendezvous diving package with Kate's Private Diving Service for their guests who wish to do a few scuba dives. There will be no other divers picked up from other boats as this is YOUR private rendezvous dive. Divers are provided with all diving equipment, private dive boat, and Master Scuba Dive Instructor, along with snacks, towels, etc. All dives are 2-tank dives.